On SALE! Until April 15th or while quantities last! 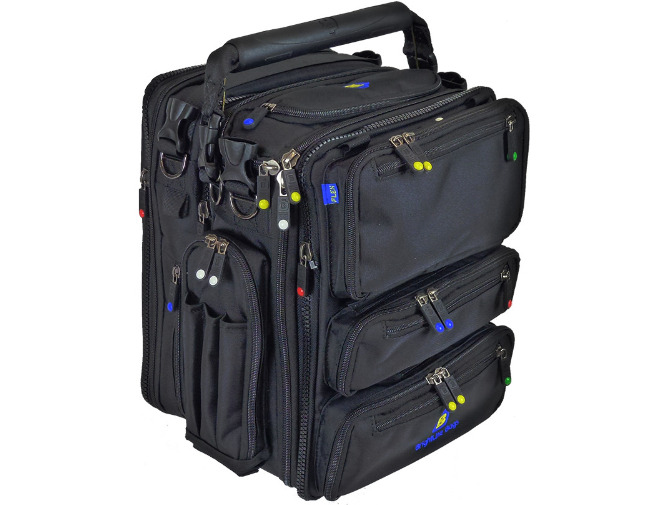 The B7 FLIGHT is perhaps the most useful flight bag ever designed. SALE! Unil April 15th 2019 or while quantities last. 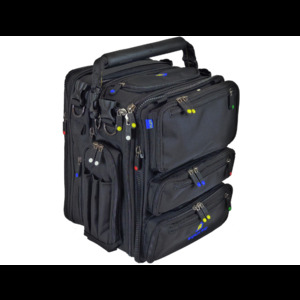 The B7 FLIGHT is perhaps the most useful flight bag ever designed. It's a fact that some days you need more gear than others. The B7 lets you carry a full set of flight gear for cross country and basic IFR flight. And then it lets you downsize to a smaller bag for those days when you're just going to take a quick VFR flight. The B7 FLIGHT is designed to hold one or two full-sized headsets plus a full suite of charts, and of course your iPad (or two), a handheld radio, plus all the small stuff you'll want along for the ride. 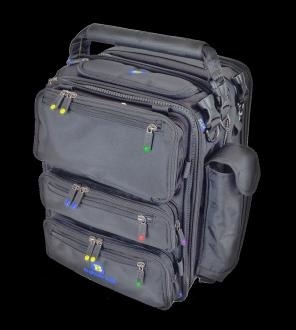 It also serves as an unbeatable carry-on personal bag when traveling on commercial flights, or just as a terrific daily bag for a wide variety of personal and professional uses. The CS4 and CS3 provide seven inches of storage depth (hence the name, "B7"), but keep in mind that there is also three thin flat storage areas BETWEEN the four modules for additional slim storage. (Remember, it is a soft bag so it can expand slightly in every direction.) Keep in mind also that you can add any other Center Section to the B7 (like zip a CS2 in between the CS3 and CS4) to add more storage on certain days. 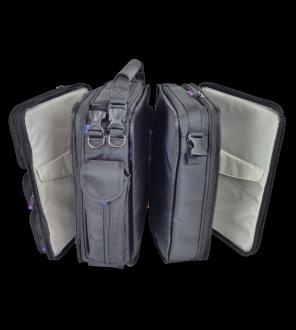 Any FLEX System module can zip onto any other FLEX System module. The Main Compartments of both the CS4 and CS3 have locking zipper sliders. The B7 FLIGHT will very commonly be used to carry two full-sized aviation headsets of any brand inside the CS4. (There is a nice, slightly-tricky way to place two large headsets - like the BOSE A20 - inside this space. Just "intertwine" the ear cups in opposite directions. It's really nice to fit two headsets of any kind in such a relatively small space.) There is a specially-designed pocket on top of the CS4 to hold Sunglasses and their case. And then the CS3 will be used to hold a library of charts, or a iPad in it's bulky case, plus kneeboard, etc. A small collection of charts or flight docs can go in the spaces between the four modules. Surprisingly, a 13" Ultrabook or MacBook Pro can even fit into this "in between" space, and the iPad (or other tablet) can go in the main pocket on the FLAT CAP REAR. The B7 FLIGHT also works amazingly well as a daily personal bag and/or as a commercial carry-on bag. A 13" laptop plus a load of documentation plus an iPad, plus all the small stuff like cables, adapters batteries, and support stuff for all your technology, your digital camera, snacks, etc - all of this fits easily in this bag. Even your noise-reduction headset for those long flights. Storage on the B7 starts with the POCKET CAP FRONT: The POCKET CAP FRONT acts like the "hub" for your entire FLEX System. No matter which configuration you carry you'll be attaching the POCKET CAP FRONT to one end of your bag. And it's the "hub" because it holds all the important small stuff and tech stuff and personal stuff that you want with you no matter what. If you change configurations, you'll always move the POCKET CAP FRONT to the new configuration which means you'll always have all this key stuff with you, without any repacking or reloading. If you're an Airline Captain and you plan on carrying your B2 COMPUTE on your J-Hook hanging off the back of your rolling suitcase, you should swap out the included MAIN HANDLE and instead purchase the MAIN HANDLE J-HOOK (see the Accessories Page). This alternate handle serves to keep the J-Hook centered on the BrightLine Bag.